In the February 2012 issue of Vanity Fair, the now-deceased Christopher Hitchens has a post on Charles Dickens. While the main thesis of the essay is on how Dickens kept his inner child alive, Hitchens reveals what readers might find shocking but which any reader who is also a writer will understand as a given–that the “real” Dickens felt himself to be more present in his villains than in his heroes. According to Dostoyevsky (who met Dickens in the offices of his literary magazine in 1878), “He told me that all the good simple people in his novels, Little Nell, even the holy simpletons like Barnaby Rudge, are what he wanted to have been, and his villains were what he was (or rather, what he found in himself). . . “(VF 70). To prove this, Hitchens underlines Dickens’ prejudices and then, in respect for the literary lion, Hitchens demonstrates the attempts Dickens made to atone for the faults to which his attention was drawn. Lovely. I am not here to speak ill of the dead. I have understood for quite a while that Hitchens was opposed to religion in general, ascribing the ills of mankind to faith rather than to the weaknesses of humanity. However, it seems ironic that a writer of such perspicacity, so gifted at pinpointing the weaknesses of individuals and institutions, should have missed the distinction that since it is humans who make distortions, the goal is balance. Literary wars continue–our humanity is in how we wage them. 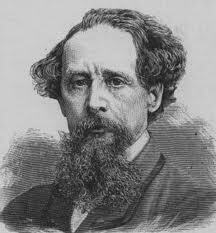 Dickens did not do so badly.